The Great Persecution (303-313) - Ever since the crucifixion of Christ and mission of the Apostle Paul, Christianity spread through the Roman Empire like wildfire. 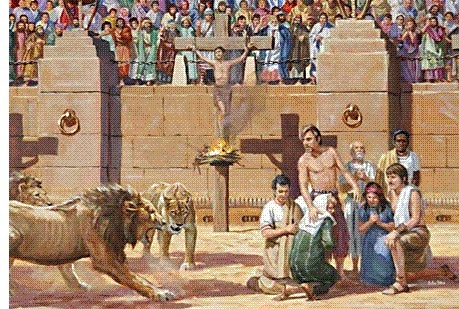 Not long after, persecution of the new faith began by the Roman authorities. The Romans were known to be tolerant of existing religions with which they came in contact. After they conquered a foreign land, they generally allowed the vanquished to continue to worship their gods, so long as it didn't threaten Roman authority. And so it was with the Jews in Judea when the province was first brought into the empire (of course we know that changed in the late 1st century. See Jerusalem Destroyed). Likewise, when Christianity initially began to spread, it was viewed by the Roman authorities as an offshoot of Judaism, and largely left alone. However, as more and more Jews began to reject Christ and distance themselves from Christianity, Rome increasingly began to see it as a new religion. One which quickly became a threat to the empire. Christians declared Christ to be their king, not the emperor of Rome. As a result, attitudes toward Christians changed. Nero was the first emperor to persecute them. Subsequent emperors also dealt harshly with Christians off and on for the next couple centuries. The persecutions reached their most intense under Emperor Diocletian. In 260, the first laws were passed guaranteeing the rights of Christians within the empire. And when Diocletian first became emperor in 284, he respected those laws for the most part. However, he was an "old school" Roman ruler. He was a strong proponent of activist government who longed for a return to the early days of the empire (at this point, Rome had begun its long gradual decline). His first move was to purge Christians from the military. Then in 303, he overturned the laws passed in 260 and issued edicts outlawing the faith and compelling all citizens to worship and sacrifice to the "old gods" of Rome (Jews were exempted). Those who did not were subject to imprisonment or even execution. This attack was much more comprehensive than earlier ones. Nero, for example, while he executed Christians, restricted his attacks to Rome only. The Diocletianic Persecution was empire-wide. Many historians have argued that Diocletian himself was not particularly hostile towards Christians, but that it was his adviser (and successor), Galerius, who was a strong proponent of the old gods and persuaded the emperor to issuing the edicts. For example, in the first one published, Diocletian decreed that enforcement should be pursued without bloodshed. This went against Galerius' desire that those who disobeyed should be burned alive. The ultimate goal of the Roman government was to stamp out Christianity completely. To emphasize this, the first act committed by the government, the destruction of a new church in Nicomedia, occurred on February 23, 303. February 23 was the Feast of Terminalia, in honor of Terminus, the god of boundaries. It was the day when the termination of Christianity had begun. But in an empire as large as the Roman, it was impossible to enforce laws universally throughout the land; and Christians were not persecuted uniformly. They tended to be attacked more in the East than in the West, and in some of the outlying provinces like Hispania and Britannia, may not have suffered any persecution at all. But for those who did, it was not pretty. Churches were destroyed and Christian Scriptures burned. In spite of Diocletian's initial decree, bloodshed was often the result. The local magistrates had discretion over capital punishment. Leaders were primary targets on the theory that their persecution would serve as an example and scatter the rest of the flock. 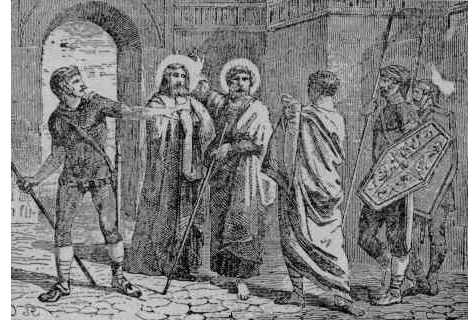 The first official martyr was a man named Eutius of Nicomedia. When the decree was posted in his town, he tore it down a ripped it to shreds. Shortly after, he was arrested for treason, tortured and then burned alive. By the summer of 303, a second edict was published ordering the imprisonment of all clergy. The next year another edict was issued requiring all citizens to make their sacrifices to the gods publicly, and if they refused, they were to be executed. The exact number of people who were killed during the Great Persecution is not known. The only figure listed from the early church comes from the Liber Pontificalis (Book of Popes), which claims as many as 17,000 in one month died. This is an exaggeration. 17,000 total is more realistic. Modern historians put the number at closer to 3,000 to 3,500, but no one knows for sure. The persecution came to and en in 311, when ironically, the man who was behind it in the first place, Galerius, terminated it with an edict of toleration, admitting that it was ultimately a failure.